Nick Fowler is an American writer and musician who began life as a musician while studying at Cornell University. In 1989, he moved to New York City and teamed up with Gregg Wattenberg, Michael Haar, and Greg Smith to form Tonto Tonto. After a few successful years, Fowler began writing for a number of major publications, including GQ. Fowler has published two novels. His first was released in 2002 entitled A Thing (or Two) About Curtis and Camilla. The novel received praise from a ... See More number of publications, including The New York Times Book Review. This novel was followed by My Virtuous Sister, which was released in 2019. The novella debuts MIA 20-year-old Welsh émigrée Peddie Smout, famous as a rock star at the end of the last millennium. Among the post-9/11 rubble, her younger brother and soulmate Nate arrives in holiday-season Manhattan in search of his sister. By piecing together the ragged index cards of the makeshift diary she'd secreted in a Grand Central locker, Nate unfolds the story of previous New Year's Eve, 1999, and the brief fame of songstress Cordelia Peddie Smout, who after seducing everyone in the music business only to lose her record deal (and gain a heroin habit), finds salvation in the form of Alcoholics Anonymous—or, rather, its star member: Teddy D, at whose "sober" New Year's Eve party we encounter not a few surprises. While Peddie and Nate manage geographically to escape a physically-abusive, narcissistic bully of a father, peace of mind proves another thing entirely. A story of revenge, redemption—love and virtue. 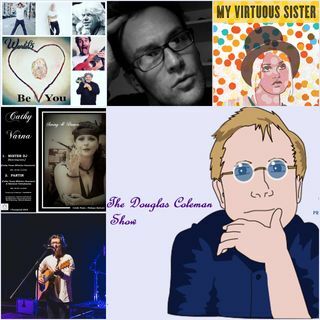 The Douglas Coleman Show is now offering a complete radio promotional package for music artists. Your track will air 28 times a week for 1 month. Your track will air over all of our online and terrestrial platforms as well as permanently archive on Spreaker, Itunes and many other sites. With this package, you will also get a 15min interview on our show to promote your latest, single, EP, LP or upcoming gig. Similar packages like this can run hundreds of dollars and often are subscription based. Our package is a one-time fee of just $49.99. Let’s work together to get your music heard. Go to http://douglascolemanmusic.com/crpp for complete details. If you’re interested in being a sponsor on The Douglas Coleman Show, please check out our packages on Patreon or contact us directly. OR if you’d prefer to make a one-time donation, please check out our GoFundMe.